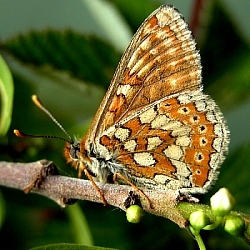 Habitat: The Marsh Fritillary is local, being most frequent west of the Shannon, in areas where its food plant Devil's-bit Scabious is plentiful. 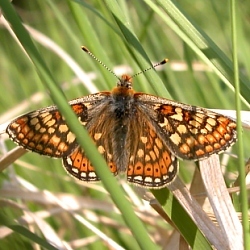 The Marsh Fritillary is an Annex ll species under the Bern Convention. It is considered to be vulnerable on a European scale. A considerable amount of it's Irish habitat has been lost through drainage and peat extraction. purplish-brown and can be fairly easily seen on the leaves. 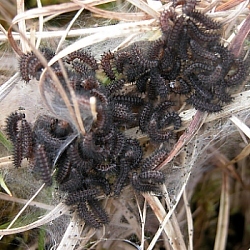 has bands of white speckling on the dorsal surface and along the line of the spiracles. 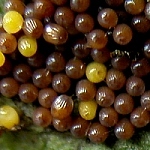 The head is black and the prolegs are reddish-brown . they live, feed and moult. vegetation, either close to or on the ground, where they overwinter. 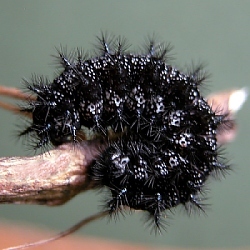 they are fully grown and disperse to pupate. This larval stage lasts c.10 months. 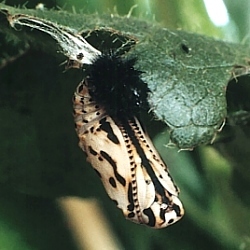 They pupate on stems and foliage suspended by a silk pad on which they attach their cremasteral hooks. Butterflies emerge in 16-26 days. lays her eggs. 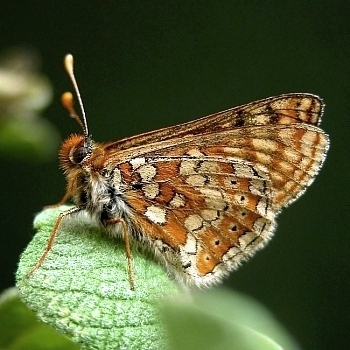 The Marsh Fritillary keeps office hours, flying from 9.00 a.m. to 5.00 p.m.